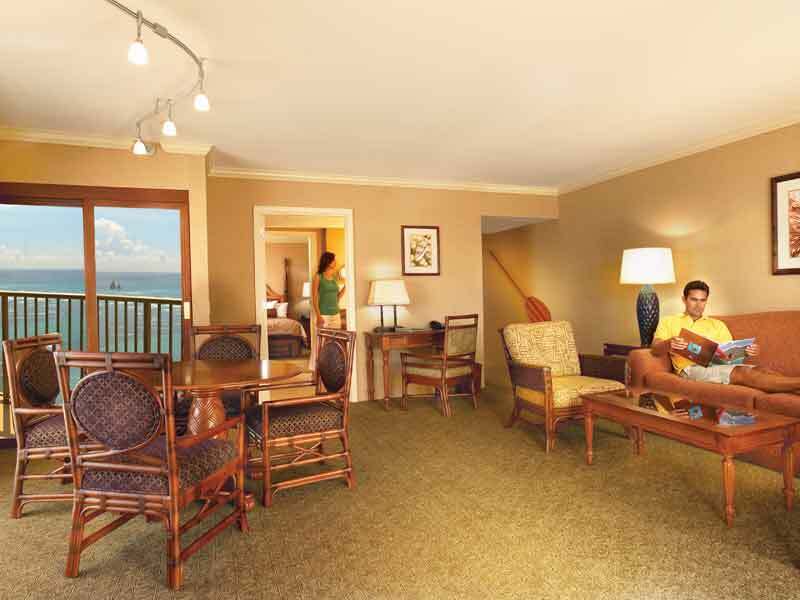 Experience the true Hawaiian atmosphere at Outrigger Reef Waikiki Beach Resort! Whether you’re watching the live entertainment while sipping a cocktail or treating your tastebuds to traditional Hawaiian pupas (appetisers) you’ll find Hawaiian warmth and charm in all corners of this resort. Set between the shores of Waikiki Beach and the bustling city centre, Outrigger Reef Waikiki Beach Resort is perfectly located within walking distance to the everything you need for the perfect Hawaiian holiday. Close to both the Waikiki Beach Walk with its fabulous array of shopping, eating and entertainment venues, as well as the upmarket shopping precinct of Kalakaua Avenue. Outrigger Reef Resort is not only close to some of the best dining options in Waikiki, it offers its very own selection of appointed restaurants and bars too. Immerse yourself into the extensive list of guest services the resort offers and keep your fitness routine on track at the 24/7 fitness centre or get pampered in complete comfort at the resorts day spa, Laakea Spa; Look for a bargain in the range of shops and boutiques within the resort or fall in love all over again and renew your vows in a unique Hawaiian ceremony; Relax by the pool or visit the tour and activities desk for ideas on things to do outside of the resort. Feel like you’ve stepped into a modern Hawaiian village when you stay at Outrigger Reef Waikiki Beach Resort. Step inside the lobby and be greeted by warm Hawaiian hospitality and interior design that dazzles with its modern and fresh design. Enjoy the amazing location bordering the sands of Waikiki Beach that is close to everything you need for a perfect Hawaiian holiday. Fresh, stylish and beautifully appointed—Standard (King) rooms will ensure you’re completely relaxed throughout your entire Hawaii stay! These rooms offer 32sq. metres of space and boast a plush King bed. Start your mornings on the balcony or wake slow, watching a program on your 55” LCD TV. Features include air-conditioning, Wi-Fi, a coffee/tea maker, cable channels and pay TV movies and a fridge. There are blackout drapes so that guests can sleep in late and the separate en-suite bathroom features a bathtub/shower combination. Standard (King) rooms can comfortably accommodate 2 guests. Decorated in sophisticated, soothing tones, Standard (Double) rooms are ideal for those wanting to relax with the family, or a group of friends. Offering 32sq. metres of space, plenty of storage, a private balcony, floor-to-ceiling windows and black-out drapes, these rooms cater for your every need. Standard (Double) rooms also feature a 55” LCD TV with cable channels and pay TV movies, air-conditioning, a coffee/tea maker, Wi-Fi and fridge. The private en-suite bathroom features a bathtub/shower combination and a lighted cosmetic mirror. Standard (Double) rooms can accommodate up to 4 guests. Spread out across 33sq. metres of space and enjoy the stylish appointments that fill your City View (King) room. From the plush King bed to tasteful lighting choices and blackout drapes, these rooms are the ideal place to retreat to and relax. 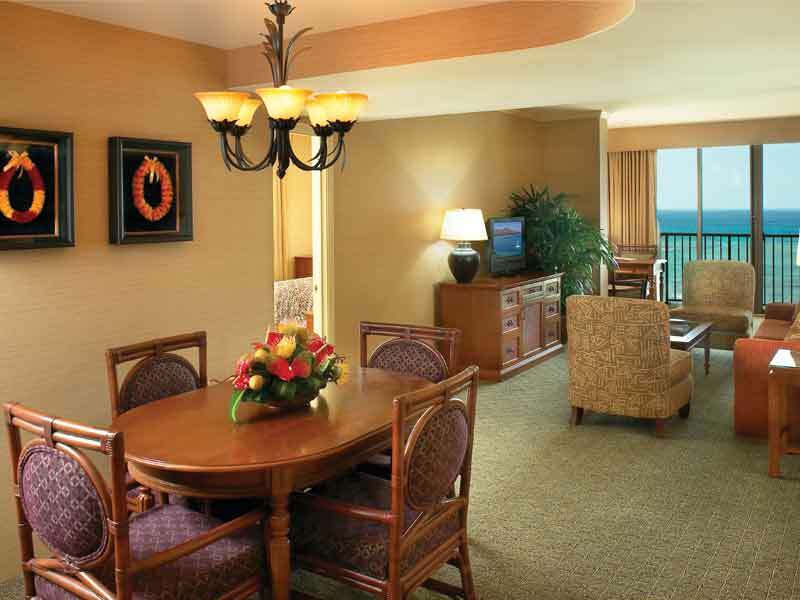 Take in the dazzling Waikiki lights at night on your private balcony or keep cool inside in air-conditioned comfort. City View (King) rooms also feature a 55” LCD TV with cable channels and pay TV movies, Wi-Fi, an MP3 clock radio, coffee/tea maker, fridge and more! Start each day with refreshed thanks to the bathtub/shower combination in your private en-suite bathroom and make use of the lighted cosmetic mirror. These rooms accommodate 2 guests. 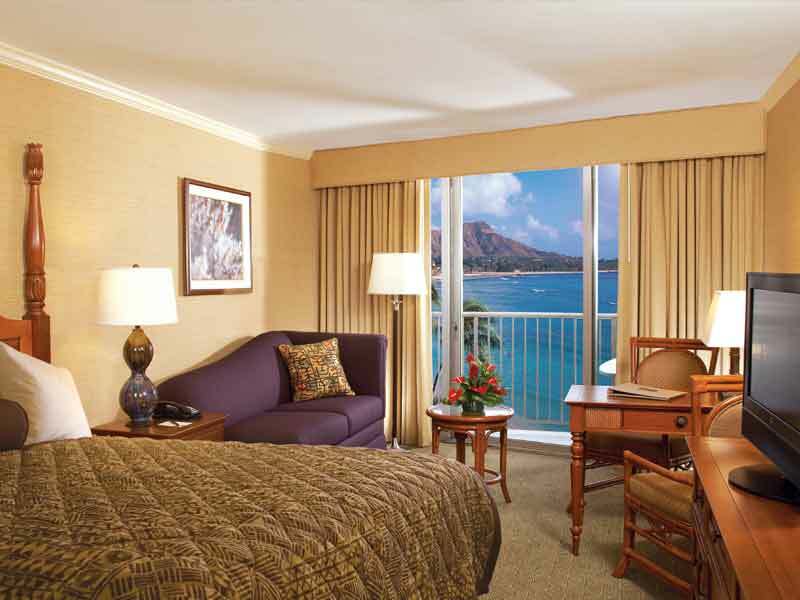 Soak up the energy of Waikiki in your City View (Double) room. Facing the dazzling Waikiki skyline and boasting a private balcony so you can take it all in, these 33sq. metre rooms will give you a true sense of place. They feature either 2 Double beds or 1 Queen bed and a double sofa and the en-suite bathroom features a bathtub/shower combination. Other features include a 55” LCD TV with cable channels and pay TV movies, air-conditioning, blackout drapes, a coffee/tea maker, Wi-Fi, fridge and more! City View (Double) rooms can accommodate up to 4 guests. When you stay in beautiful Waikiki, you’d be mad not to make the most of the view! Offering up to 33sq. metres of well-appointed space and a plush King bed, these light-filled rooms will have you in holiday mode in no time at all. Let fresh coastal breezes wash over you on your private balcony and look down toward the dazzling Pacific Ocean. Partial Ocean View (King) rooms feature a 55” LCD TV with cable channels and pay TV movies, Wi-Fi, air-conditioning, blackout drapes, a coffee/tea maker, fridge and more. The en-suite bathroom boasts a bathtub/shower combination and a lighted cosmetic mirror. These rooms can accommodate up to 2 guests. Travelling with 3 others, but still want to make the most of the view? Partial Ocean View (Double) rooms are ideal as they offer 2 Double beds and a private balcony that looks out toward the Pacific Ocean! Your privacy will be maximised thanks to the separate en-suite bathroom with bathtub/shower combination and blackout drapes and there are plenty of in-room features to keep you entertained. These include a 55” LCD TV with cable channels and pay TV movies, Wi-Fi, an MP3 clock radio and more! There’s a fridge, air-conditioning and so much more. These 33sq. metre spaces can accommodate up to 4 guests. 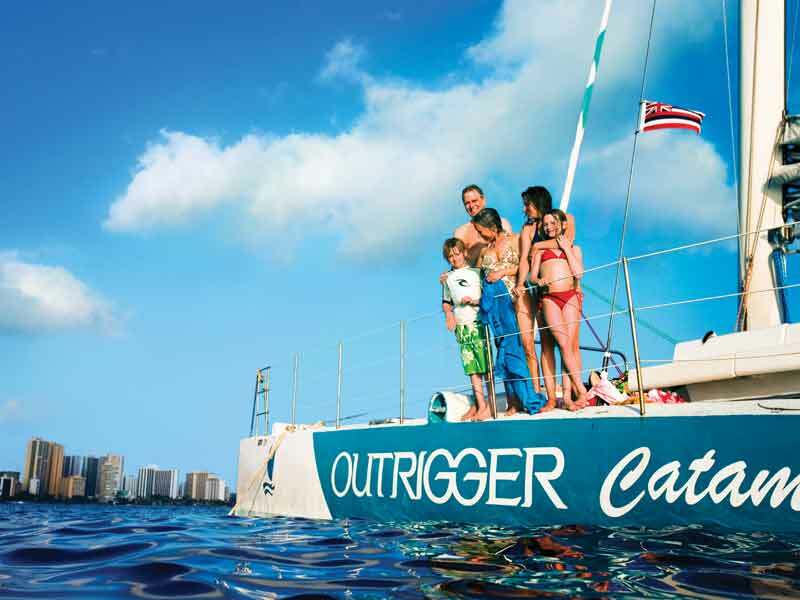 Outrigger Reef Waikiki Beach Resort is set in the heart of Waikiki on Hawaii’s most famous beach, Waikiki Beach, overlooking Diamond Head Crater and the tropical waters of Waikiki. 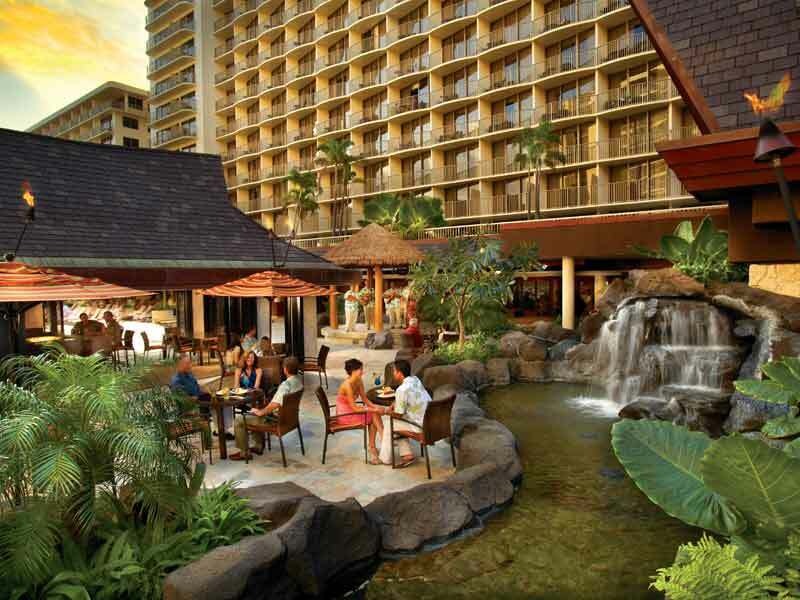 The resort only a 25-minute drive from Honolulu International Airport. Whether you want to spend your days surfing the idyllic longboard waves, shopping in designer outlet stores, or sipping MaiTai’s by the pool, there is something for everyone in Waikiki! With dining options to suit every taste, budget and occasion, it is a foodies’ paradise! Get a taste of Hawaii from one of the resorts on-site restaurants or head down town and experience the culinary flare of the city. Explore the island of Oahu and visit Pearl Harbour to learn about the military history of the island or explore the North Shore that is famous for its shrimp trucks and huge pipeline waves. You don’t even need to leave the resort if you don’t want to, Outrigger Reef Waikiki Beach Resort has impressive amenities on-site available to guests. Relax by the poolside and sip, eat and swim to the sounds of island music or visit the resorts day spa for some well-deserved pampering. Right on the beach front. Rooms were spacious and clean with a comfy bed and nice toiletries in the bathroom. Lovely pool area. We enjoyed the nightly music (live local bands). We will definitely stay there again.